Instant Knockout Fat Burner – Is it effective? Instant Knockout is a fat burning supplement that uses thermogenic compounds to help speed up your metabolism to burn stored fat faster. Instant Knockout claims to be an all-natural fat burning supplement that combines thermogenic effects with appetite suppressants to burn fat and prevent more fat buildups in your target areas. Instant Knockout combines fairly common ingredients for fat burning, like caffeine, B-vitamins, Green Tea Extract, and Cayenne. Even though Instant Knockout is not the first to have all of these ingredients combined, it’s still being marketed as a “breakthrough” product that should deliver professional results. While Instant Knockout doesn’t have the kind of health risks as supplements with ECA stacks and DMAAs, its caffeine content may be too much for many. At 350mg per serving, Instant Knockout’s caffeine content is more than likely to cause more side effects than energy. At first glance, Instant Knockout’s packaging is one of the best that we’ve seen so far. It’s in a clear, fist-shaped bottle filled with red capsules. While its bottle is innovative and eye catching, it doesn’t directly correlate to the effects of Instant Knockout. Is Instant Knockout as innovative as its packaging? We’ll know as we dig deeper into Instant Knockout to know more about its benefits and side effects. As expected, people who used Instant Knockout had a huge surge of caffeine rush after taking Instant Knockout. Caffeine is a metabolic booster and it heightens your senses. It’s easy to spot a caffeine rush. In fact, majority of the people who used products with caffeine say that they thought that the product was effective as soon as the caffeine kicked in. You’d probably get the same results with a much-cheaper caffeine tablet. Users who have taken Instant Knockout complained about the side effects of caffeine. Since Instant Knockout’s caffeine content is higher than the usual thermogenic supplement, it’s expected that more people would experience adverse effects from caffeine. Some users complained about angina, palpitations, and insomnia despite being tolerant with caffeine. Aside from the caffeine-related reactions, reviews about its actual effects are very few, and some are even too good to be true. 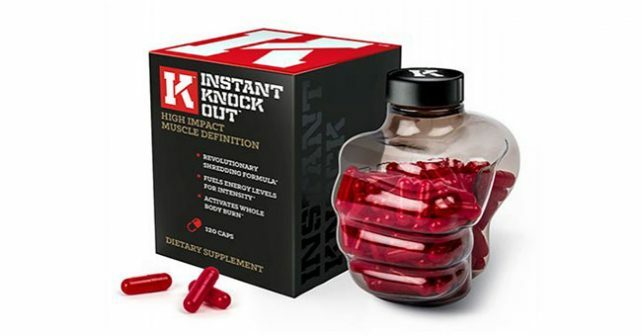 What we liked about Instant Knockout is its transparent publishing of the ingredients included in the supplement. Many other supplements would hide their mix in a “proprietary blend” to possibly hide the miniscule amount of effective ingredients, or to hide ingredients with dangerous side effects. Having straightforward supplement facts is a breath of fresh air for the supplement industry. It’s always good to go natural, especially when dealing with fitness. However, not everything that’s natural is good for your body. Have a look at the supplement facts first to see how much of this natural stuff you’re putting in your body. If you’re looking for an all-natural way to burn fat, check out Garcinia Cambogia (Garcinia X) and colon cleansing (Flat Belly) for best results.